Lots of people looking at this page. Its March 3rd, 2010, and I have no real updates. No more cars have been seized that I know about. I have not talked to Daryl in a long time. If I hear anything, good , bad or indifferent, I will post it up on this blog.At this time, its just lawyers talking on each side. June 9th , no new updates yet, although I have had contact with a lot of people with concern over what will happen next. It is hard to say exactly what is going to happen. It will all depend on the attorneys office and what charges are brought up. July 1st, still nothing new except the Kaizo website is down. I have not heard of anyone having any other issues yet, but I still get a few emails a week from people asking questions. July 2nd , the inital investigation was to check out charges of smuggling and violations of the Clean Air Act. The government always goes after the Clean Air Act. Everything is still in a holding pattern until any actual charges are filed. 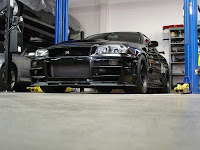 I also found out besides the "buggy" car that was not impounded(it had a VW engine in it), the black R34 had no driveline in it. EPA regulates the entire vehicle, not individual parts, for cars, light trucks, and motorcycles. If an engine is not installed, and is to be used in a car, motorcycle, or light truck, it may be imported as an automotive part. No approval or Customs bond is required by EPA. Importers should be aware, however, that replacement of an engine in a U.S. version vehicle with an engine of a different type or model year which is not currently covered by an EPA certificate or will be covered by an EPA certificate prior to introduction into commerce may violate EPA regulations. The EPA regulates only complete cars. It says it right there. They also say that without an engine a body is just a part. Now heres some conflicting information, also on the EPA's website. This section under "kit car policy". The production, sale and importation of automotive bodies alone (i.e., no chassis, engine or transmission) are not regulated by EPA since such units are not considered "motor vehicles" under the Clean Air Act. EPA form 3520-1 is not required for imported automotive bodies. A motor vehicle from which the engine has been removed is still a motor vehicle and is not considered a body. So does the EPA even read their own regulations ? A little bit of conflict there. One section says no engine is just a body, and its legal to import. The other section says if it has no engine then its not a body. Does the EPA even have a leg to stand on in court ? Do they pick and chose what section to pay attention to depending on what they are charging someone with ? No engine and no transmission is significant in accordance with DOT requirements. A disassembled vehicle that is shipped without an engine and transmission is treated for importation purposes not as a motor vehicle, but instead as an assemblage of motor vehicle equipment items. Such an assemblage can lawfully be imported into the U.S., provided any equipment included in the assemblage that is subject to FMVSS, but was not originally manufactured to comply with that FMVSS or was not so certified by its original manufacturer, is removed from the assemblage prior to entry into the U.S. Equipment items that are subject to the FMVSS include tires, rims, brake hoses, brake fluid, seat belt assemblies, glazing materials, and lamps, reflective devices, and associated equipment. That is direct from the DOT website. So as far as importing car parts, or a disassembled vehicle to the US, its legal as long as the parts aren't anything that is covered by FMVSS. Lets see what happens. How this plays out. I am going back to some of my old research and notes, and see what I can come up with. Comment this as well to a similar newer post of yours, but you are misreading the first EPA reg you quote. "If an engine is not installed, and is to be used in a car, motorcycle, or light truck, it may be imported as an automotive part." They are talking about the engine here being a part, not the body/chassis. there is no mention of the body/chassis being a part here as that is covered in the reg you quote next. Yes I did misread it. I need to find the correct part of the regulations. Sometimes moving a little too fast, and fail to slow down and read some of the things. The main point is DOT wise , its there. EPA wise, the engine is a part.